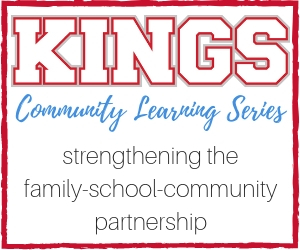 The Kings Local School District is dedicated to strengthening the family-school-community partnership as a part of the District's #KingsStrong Strategic Plan - Relate. Create. Innovate. This year, the District is bringing relevant, meaningful, and thought-provoking topics to a community forum for the purpose of promoting student well-being, academic success, and community support. The Kings Community Learning Series engages a variety of presenters to help our community become proactive and informed about topics affecting today’s families. These sessions will provide knowledge and practices that can help parents, educators, and members of the community work together to enhance and actively support Kings students.